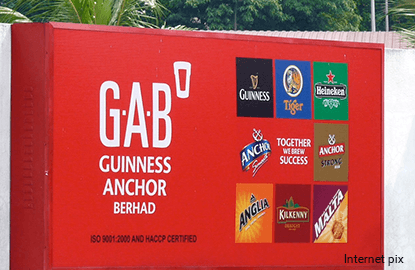 KUALA LUMPUR (March 2): Guinness Anchor Bhd (GAB) has made price adjustments to its portfolio of products in line with the increase in excise duty on beer and stout by the government. According to the Excise Duties (Amendment) Order 2016 posted on the Royal Malaysian Customs Department's website, the excise duty for beer made from malt will be changed from RM7.40 per litre and 15% ad valorem tax, to RM175 per 100% volume per litre effective March 1, 2016. The amendment represents a shift from a volume based tax structure to taxes based on alcohol content, in other words the higher the alcohol content in a product the higher the tax imposed. In a statement today, GAB managing director Hans Essaadi acknowledged the increase in the duty, but did not specify the quantum of the impact of the duty on its products pricing. "GAB acknowledges the news that the government has decided to raise excise duty on beer and stout effective March 1, and as a result we have made price adjustments to our portfolio of products in line with the new tax structure. "Malaysia's beer excise duty is the second highest in Asia and third highest in the world. The state of the economy is having a significant impact on businesses and consumers and the latest increase in excise duty on beer and stout will make the environment more challenging to our industry," he said. He added that the company is also concerned that the demand for illicit and unregulated alcohol products may increase as a result of the excise hike. GAB's popular beer brands include Tiger, Guinness, Heineken and Kilkenny. GAB shares ended the day up six sen or 0.43% at RM14.02 arriving at a market capitalisation of RM4.24 billion.